After the euphoria of last Sunday in the Champs Elysees gutted about the Mens Road Race today! CAV you deserved better! 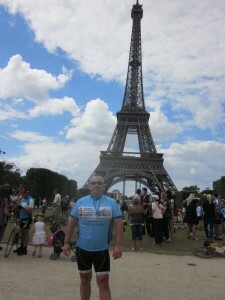 Proudly wearing the Vinghoe Velos Logo all the way to Paris! Amazing how many people asked about the R&C! Turning to tomorrow, meeting outside the R&C at 0950 for a 1000 start a little spin for you all before returning for some isotonic rehydration and to cheer on the GB ladies in the Road Race. Just to let people know that Mary is planning a more sedate Sunday ride starting at the Rose and Crown at 10am, so anyone who hasn’t been out for a while and is looking for a gentle twenty miles or so, this could be the ride for you. No planned route, but aiming to be back at the pub between 12-12.30. Have a lovely ride. It looks dry and maybe sunny tomorrow, so 10am outside the Rose and Crown for another tea and cake adventure- see you there. Formula 1 is for many the pinnacle of motor sport, where an elite group battle to become world champion. In cycling a slightly larger, but no less significant group of indivivuals, is battling it out across the water in a land where Sarkozy was once president, to become the winner of the Tour de France. As I draft this post Team Grey Skies Wradley Biggins looks set to become the first man from Blighty to achieve victory in this historic challenge. However, much like Formula 1, the man with a bit of talent depends on the support of a great team of engineers, physios, strategists, and the like to achieve success. In this respect I can advise that Wradley’s success could very possibly be down to the efforts of the Vinghoe Velos. I’d like in this weeks post to mention those of us that have assisted in this monumental effort. So first up we have Have Dowe and Hohn Jeggerty. Some months back Hohn was asked by Team Grey Sky to complete an advance ride of the Alpe d’Huez climb, high up in the Alps, to ensure that the Pesky French weren’t littering the roads with tacks. With little time and little fitness Hohn needed to act fast to ensure his readiness. Luckily for him Have had a collection of “Classic Hill Climbs in the Chilterns” to hand which he readily handed over saying “ride those boyo”. I cannot confirm if Have is a Geordie or Welsh. As you will have seen from last weeks post Hohn crested the climb well ahead of the rest of the competitors and thus ensured a safe route for all. 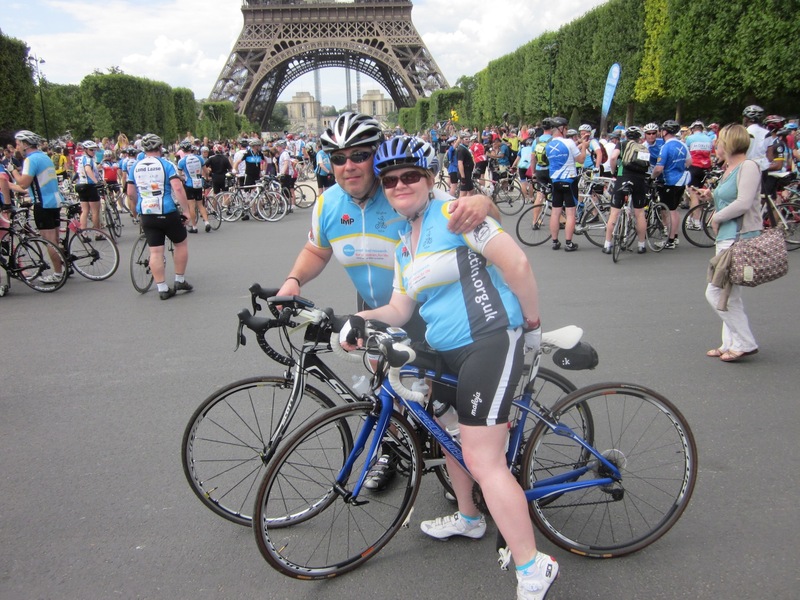 Next up, Andrew and Jose, who on Wednesday headed of from London to Paris. (I’m struggling with a spoonerism for Andrew, but Joses’ isn’t too bad) A review of their current tweets suggests that they will reach Paris in time for the finish where Jose will be providing Wradley with a motivational speach prior him setting of on his final few laps. Those eagle eyed veiwers amongst you will have seen Jose on National television this week giving the very same assistance to Pictoria Vendleton. But this is not all, for in mid September, Him and Jete, will popping across the water with a crew of velos for their Normandy invasion. You may be of the opinion that this is just a jolly, but I can assure you that our intrepid bunch will be on a reconnaissance mission to ensure this success is repeated next year. They might also try a little local wine and beer on route, to ensure they meet their Isotonic requirements. Now onto more important matters, this weeks ride. You can find it here. Having taken sufficient enquiries for Jerseys I am delighted to say that we will be placing an order for this much sought after piece of clothing on Monday 23rd July. In doing this the Jerseys will be delivered within 5 weeks and in time for the Normandy Invasion ride in September. Cash or Cheque to the value of £38 per jersey made out to “A J Hetherington”. Finally tomorrow is the day that Jose and I finally head off on our mission to raise money for Action Medical Research we look forward to cheering both Cav and Wiggo into Paris on Sunday and seeing you all on our return. Following requests for the much sought after Jersey a re-run is being planned. Subject to confirmation these would be delivered before the end of August. If there is anyone other than our 4 intrepid tandem riders and ‘Bono’ looking for one please let us know ASAP as the intention will be to place the order next Monday. To Walk or Not to walk that is the question! As many of you know the man with all of the wit and off the cuff banter is busy with other little ditties. It falls to me to do the rides this week as our webmaster Mr Hegs is busy taking the mountain stages of the TDF by storm, well done John for those of you that don’t recognise him this really is John but he does need to eat a few more pies, Elke you really must start to feed him again soon! Rumour has it he was waiting to help Cav up the hill! The usual 10am meet at the Rose and Crown- will it be as wet as last week? Best to bring a rain coat in case. If the weather is too bad, would the ride to the Rose and Crown count? We could just have tea and cake…..
To be fair, we were blessed with a very dry winter which meant that we had some super rides that while cold, they didn’t involve puddles. Our intrepid tea riders had a fab time today despite the less than ideal conditions so don’t let weather put you off joining the Velos ride tomorrow morning, even if you have to resort to dusting off the hybrid or mountain bike. As always, we gather together at the Rose and Crown from 9:50am.